"Rescuing and rehoming dogs is one of the most satisfying and rewarding things you can ever do. I look at it as God's work and feel that this mission is truly His calling as it is a work of mending broken hearts and giving people unconditional love." 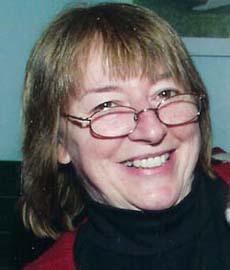 Shirley Shirley Moore is the President and Founder of Save A Dog, Inc., a Massachusetts-based dog rescue and adoption agency incorporated in 1999. Shirley and her husband, Dave, ran the agency out of their home for the first ten years, and then moved the operation to 604 Boston Post Road in Sudbury, MA. Together Shirley and Dave, with the help of dozens of volunteers, have rescued and rehomed thousands of abandoned dogs over the past 13 years. Shirley and Dave used their management experience to successfully build Save A Dog into the humane society that it is today. Over the years that they lived with literally thousands of dogs, they immersed themselves in dog behavior both through first-hand experience and by attending many workshops on dog training and canine behavior. Both taught dog obedience courses and rehabilitated dogs with difficult behavioral problems. Shirley uses her background and skills to select adoptable dogs for those who choose to adopt a dog, rather than buy. Shirley is a professionally trained Homeopath and uses this gentle system of medicine to treat the rescued dogs who reside at Save A Dog and provides free consultations to pet owners who cannot afford traditional veterinary medicine. 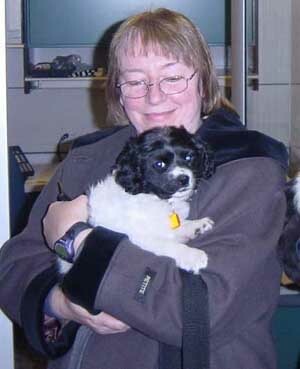 Shirley discovered homeopathy after doing search and rescue of abandoned dogs and cats in New Orleans following Hurricane Katrina. She developed a case of ringworm that was unresponsive to conventional medicine, but cleared up in a couple of short days using an over-the-counter homeopathic remedy. This sparked Shirley's interest, but the clincher was when she and others witnessed the remarkable results of homeopathy on a puppy suffering from a bee sting. "The pup was lethargic when she was brought to me by her foster mom," says Shirley. "Her muzzle was three times its normal size, she was covered in welts, and her eyes were swollen shut. Within ten short minutes after receiving homeopathic Apis, the swelling went down, her eyes opened, and she wiggled to get down to play." That was enough to convince Shirley that she owed it to the dogs to learn everything there was to know about this alternative medicine. While attending homeopathy school Shirley was presented with many dogs suffering from various ills and saw many miraculous results with this gentle therapy. Shirley graduated from the Teleosis School of Homeopathy and continues to help the shelter dogs as well as to give workshops in holistic protocols and homeopathy. Every adopter goes home with a packet of helpful information on how to care for their dog inexpensively and holistically. Shirley and her homeopathic coach, Begabati Lennihan, recently published a book A Healer in Every Home, Dog and Cat Edition with many helpful tips on how pet owners can use simple homeopathic remedies and holistic measures to treat their pets at home. The book is chock full of success stories that will inspire and empower the reader. Shirley teaches workshops to the pet-loving community and is available as a speaker on holistic shelter protocols as well as on Homeopathy for Pets and People. You can contact Shirley at the email address shirley@saveadog.org. Shirley and some of her former foster dogs. Harriet, left, was a real challenge as she was cage aggressive. She's been adopted and is the love of her family's life. Ashley, in the back, was a senior who lost her elderly parents. After fostering her for awhile we didn't have the heart to move her again so she became the puppy trainer and foster mama dog of many litters of pups from the south. 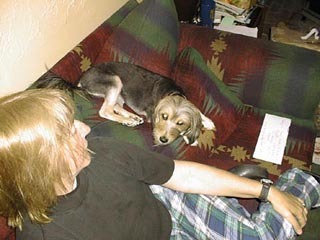 Cindy, a Tibetan Terrier, came to us as a very fearful little dog. We spent months rehabilitating her, at the cost of turning down lots of friendly dogs. We learned first hand that rescuing a dog who needs this much work is at a cost to many other dogs who don't have issues. This is painful to think about, but is the harsh reality of doing rescue work. Cindy is flourishing in her new home, but we have since decided it's best to spend our resources rescuing family-safe dogs. Cindy taught me volumes in the area of aggression training. Puppies are my specialty as I've personally fostered many litters and have kept in touch with their adoptive families. I enjoy doing the puppy consultations as it's a wonderful way to help people and their dogs avoid problems down the road when their dog grows into an adult. I realize that most people only have a puppy once or twice in a life time so I'm happy to share my knowledge and provide the necessary hand-holding during those first few crucial weeks and months. If you just adopted a puppy and want to train your dog to grow up as a healthy, socially adjusted, dog, Shirley has a wealth of information to help you avoid problems as your dog enters adolescence. Shirley and husband David Bernier, a director of Save A Dog and chief supporter of Shirley's work. Prior to founding Save A Dog, Dave and Shirley met while working together in the high tech industry. Shirley's left a career as a manager in the high tech industry to pursue her dream of saving dogs. She has developed and managed multiple departments in the area of technical publishing and Web development in the high tech industry and has used her business knowledge and entrepreneurial skills to build the all-volunteer organization. Dave works as a software engineer and also serves as the technical guru for Save A Dog. 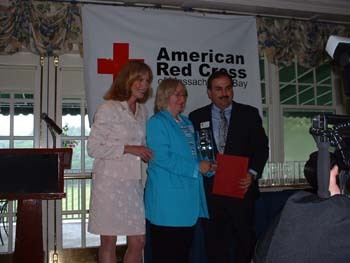 American Red Cross Animal Hero Award!